I've been using this bag for a couple months now - very well made. My son and I go to the range a couple days each week and this is the perfect size bag for 3 pistols, ammo, glasses, mag's, ear protection, stapler, and our bore sighter... Great bag and I highly recommend it! Perfect size for eye and ear protection plus small tools and target supplies. It's my range bag for whatever I shoot so I don't have to think about which holster/ammo/magazine set to take, just grab it and another bag with its own weapon-specific items and I'm always ready to go. Perfect size and solid construction. 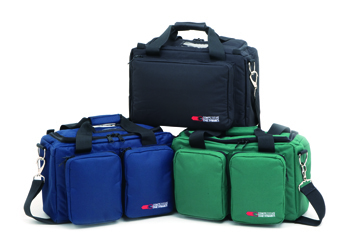 The CED Compact Travel Range Bag incorporates the best of both worlds! When travel necessitates a limited amount of luggage space, this compact range bag fits perfectly. Made of the same rugged material as other CED bags, and including space for seven magazines, two pistols, belt, hearing protection and much more, the CED Compact Travel Range Bag goes far beyond. Designed to fold flat to conserve space when traveling, this unique bag also adapts as the perfect carry-on as well. Has room for laptop computers up to 15.5” and is ideal as a briefcase for trade shows or events where a little EXTRA space is needed. Designed to CED’s highest standards in quality, this is one bag you will surely want to own! · Elastic accessory straps added to hold those little "extras"